Sweet and serene Cottage located in the Wailua Valley, within walking distance of the Sleeping Giant. 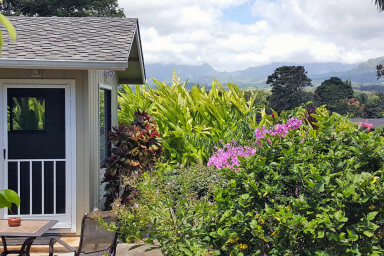 This sweet and serene one bedroom cottage is located in the lush green hills of Wailua Homesteads. Wailua is above Kapaa on the East side of Kauai. The cottage is a 15 minute drive to white sand beaches, shopping, activities and dining. Located in Wailua Valley, within walking distance of the Sleeping Giant, a wonderful hike to the top of the mountain with wonderful views of the Coconut Coast of Kauai in one direction and the Wailua valley in the other. This beautiful Cottage is a reasonable way to enjoy the serenity of the Island. It is a one bedroom, full bath, living room and kitchenette. The bedroom has a Cal King Tempurpedic, and garden views from every window. The kitchenette comes with microwave, full refrigerator, coffee maker, and toaster. There is a lanai table and chairs for outdoor dining and lounge for relaxing. There are beach chairs, mats and beach towels to use during your stay. Shampoos, lotions and other essentials are there for your use. This unit will also sleep one additional guest on a futon. Lokelani Garden Cottage is set in a park like atmosphere, surrounded by tropical flowers and vegetation. Located in the Wailua Valley within walking distance of the Sleeping Giant, three trails wind to the top of the Giant where you can see the east coast of Kauai, don't forget your camera, and in the other direction the Wailua Valley. Beautiful cottage with excellent hosts. Wonderful stay. Everything is just great. I will keep this lovely place incl. lovely hosts in my mind for ever. The garden cottage was an amazing oasis. It was perfectly stocked with beach amenities, guide books, and kitchen supplies. Everything you may need when you’re not out and about exploring the beautiful island. Mike and Sandy were very sweet and accommodating. Sandy would check in and make sure everything was going well and was always there to offer recommendations of places to explore and eat. Mike would stop over and give us fresh fruit from their garden. We loved the apple bananas and grapefruit! The garden cottage was a quaint and serene place to stay. It’s away from the touristy areas so it makes you feel a little more like a local. The views of the mountains and scenery are absolutely breathtaking. We arrived later at night so we couldn’t see anything, but upon waking up, we were greeted by the most gorgeous and lush greenery. It was an amazing surprise to see that were right in the heart of such a beautiful scene. Our stay the cottage was a memorable one! Spectacular views, comfy bed to sleep in, and hospitable hosts- everything you want with Airbnb. Lovely room with beautiful private garden, tucked away in a quiet neighborhood near Kapa'a. The bedroom is small but has everything you might need including a fully equipped kitchenette (a huge plus given the $$$ of eating out) and snorkel gear. The hosts Les & Carol were very welcoming and helpful without being intrusive at all. The surrounding country side is beautiful with lots to do in the area and easy access to the rest of the island. Sandy and Mike are verry nice and friendly people. It is always good to talk with smart people like that. We had no luck with the weather in Kauai. Lokelani Garden Cottage is Perfect! I write without hesitation that the Lokelani Garden Cottage in Kapa'a is the sweetest place you can imagine if you don't want to be on or near the beach. My friend and I were perfectly happy to stay in this absolutely beautiful spot surrounded by flowers and greenery including birds of paradise and the most exquisite orchids you can imagine - just outside every window of this cottage were flowers and greenery. The location was private and perfectly located within 5 blocks of one of the incredible Sleeping Giant trailhead locations. I hiked the trail almost every day of our stay. The most delightful experience of all was the caretaker/owners of the nearby home, Mike and Sandy. They made our stay perfect. They provided excellent guidance on places to visit, nearby markets, and best beaches, in case it should rain. I love the Lokelani Garden Cottage and have already advised friends to stay there. You will never ever find me in a hotel in Kauai - I would much prefer this cottage where we fixed almost every meal, saving lots of money. The cottage was stocked with beach towels, mats, and even snorkeling gear. The kitchen had everything a person would need from crock pot to hot plate, refer, micro wave, coffee maker, wi fi, great big TV, and did I say a perfect location? I grew to love the drive from Kapa'a into the hills above town to the cottage. It is a very short drive with little or no traffic. I will never forget this place. I am also grateful for the excellent service from Affordable Paradise. You will not be disappointed. The very best place on the island I have ever stayed. Thank you Barbara, Mike and Sandy. I can hardly wait to return. You are number one in my book. Mahalo...always. Very nice and fully equipped guest house. The hosts are outstanding friendly and committed for a great stay! We would definitely stay there again when visiting Kauai. If you stay here you do not need to visit a botanical garden (you live in a nice one). The apartment is excellent and we can highly recommend it. The cottage is completely furnished. The landlords are very friendly and helpful. They take good care of their guests and provide goodies as coffee, chocolate, fruits and give information about what to do and what to see. When we got sick they provided help in finding a doctor. 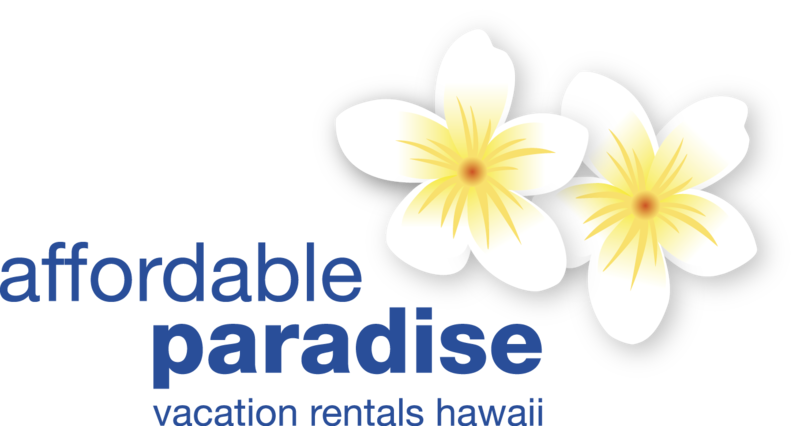 Parking is sufficient and the apartment is located beautifully in a paradise like garden which makes a stay on Kauai perfect. Even though is called a B+B, breakfast wasn't included in the rent. The B+B gets 10 out of 5 stars :-)!!! The cooperation with affordeable paradies was very good! Lokelani garden cottage is a true gem. The hosts, Sandy and Mike, were wonderful, giving us fresh fruit and flowers, and tips on what to see and where to go. The cottage is set in a beautiful garden away from the noise of traffic, but still a short drive to the tourist attractions.i hope we get a chance to return there. Our stay at Lokelani Garden Cottage in Kaua'i was more than enjoyable. Not only is the cottage very spacious, extremely tastefully and completely furnished and equipped, but also situated in the hosts' truly "botanical" garden. Our generous hosts, Mike and Sandy, not only shared with us the most delicious freshly picked fruits and flowers, but also most inspiring ideas. They made our stay an unforgetable experience. We had a wonderful stay with Mike and Sandy in this lovely little cottage in the dramatic interior of Kauai. Mike and Sandy were wonderful hosts, so generous with information, helpful and respectful of our privacy. Its perfectly located for walking direct from the cottage and easily connected into the road network so we explored the whole island. We self catered often and the kitchenette was fine for this. There is also a great beach for swimming at Kapaa and brilliant restaurants - but we were also very pleased to be away from the busy road at the town. The cottage is small - perfect for a couple. This is a perfect retreat, we would thoroughly recommend heading here to unwind and explore.